This year Lulu has been testing apple recipes like a madwoman. All of us are pretty picky about our apple desserts. We have never been big pie eaters so it takes a lot to impress us…and this year we found out favorite apple pie recipes strayed away from the traditional Thanksgiving dessert. Up first was this apple tart tatin. 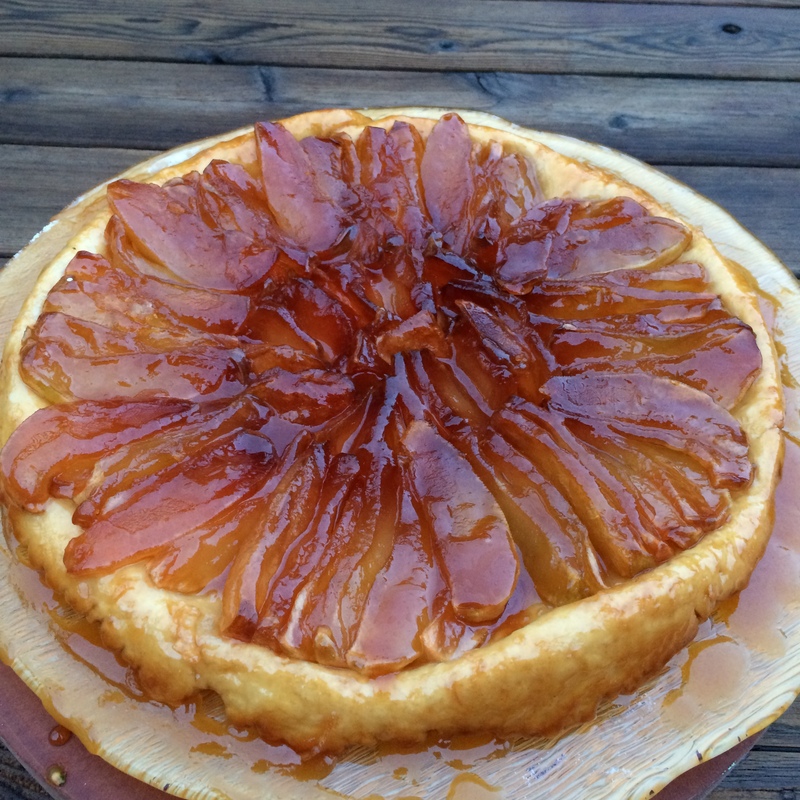 It was a very french, very simple dessert, that requires the apples to simmer for an hour over the stove, a crust is made, placed over the top of the apples, then the tart is inverted so you have a crust on the bottom and a beautiful apple design on the top. The apples are placed over the top of the butter and sugar, lined up next to each other vertically…As you can see it doesn’t have to be perfect! You cook the apples over medium-low heat for about an hour, the sugar and butter will get bubbly, you will want the sugar and butter to start to brown and you will baste the apples with the juices. 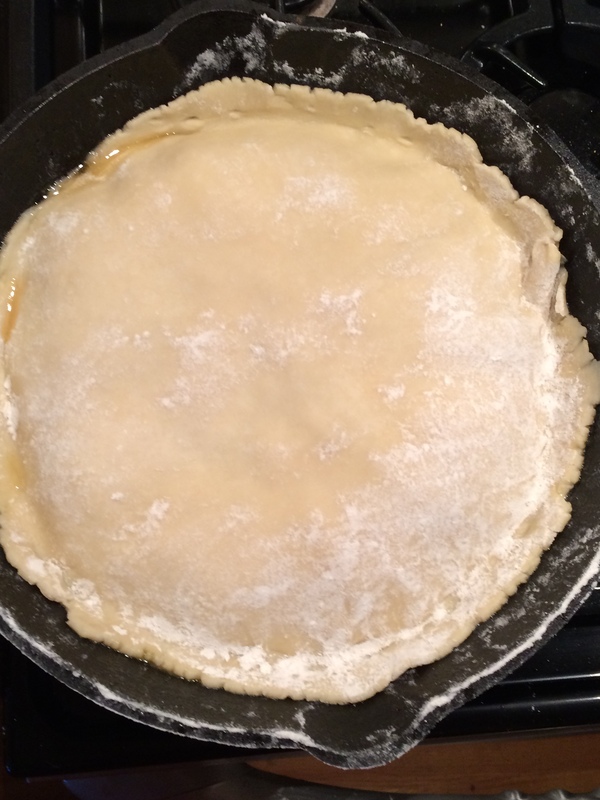 The crust is rolled out into a circle that will be slightly bigger than the skillet. 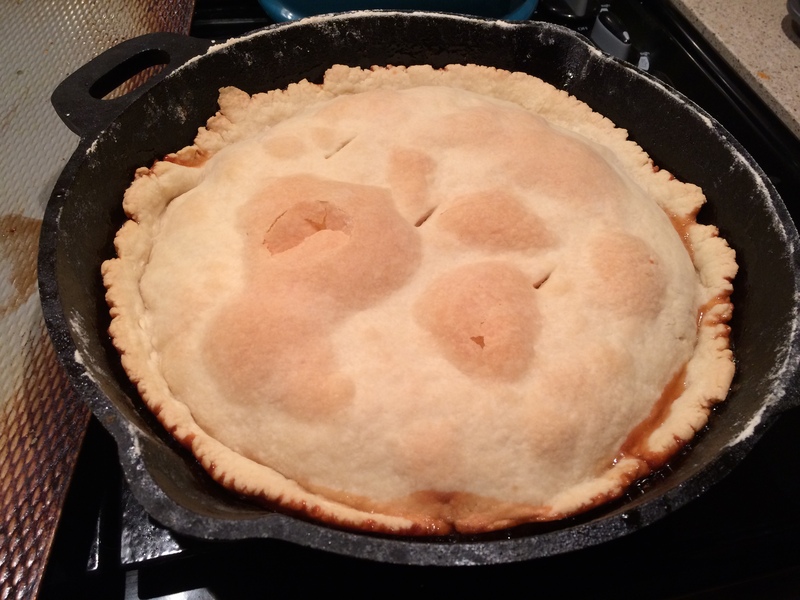 Just place the dough over the apples, cut a few slits in the crust to let steam out. The tart goes into a 425F oven for 25 – 30 minutes. It should come out looking a little golden brown. 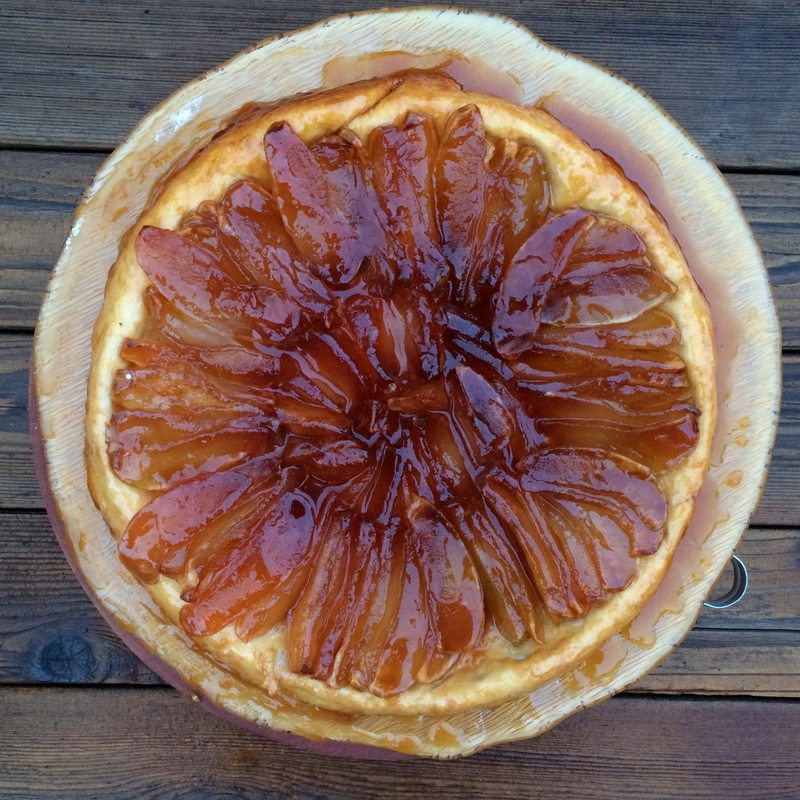 Have a serving platter or cake stand ready, preferably with a little bit of a lip since the tart is juicy!. 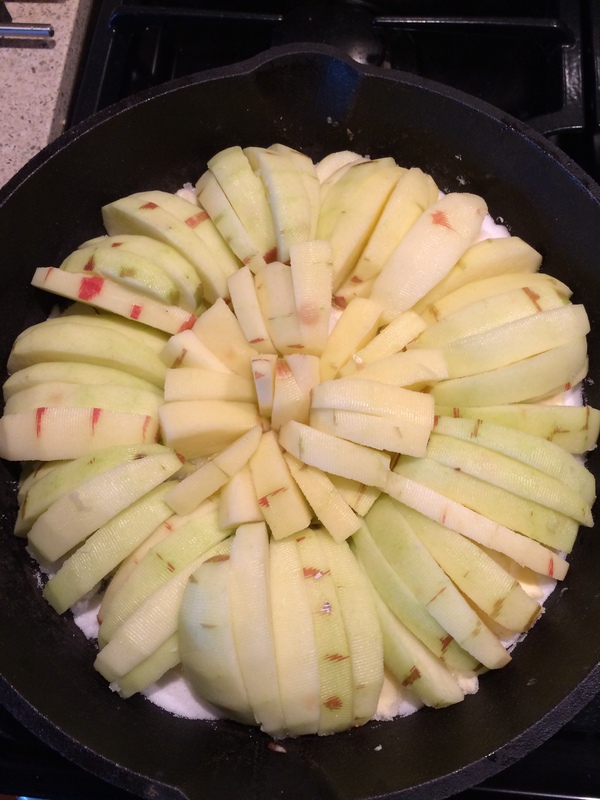 Invert the tart immediately so the crust is on the bottom and the apples are on the top. Voila, as the french would say! I really like this recipe because of the fresh, whole ingredients, and the fact that I felt fancy and french while eating it! The apples do get a little caramel-y, so it’s best served warm the day it is made. I still enjoyed leftovers the next day when the apples became a little chewy. 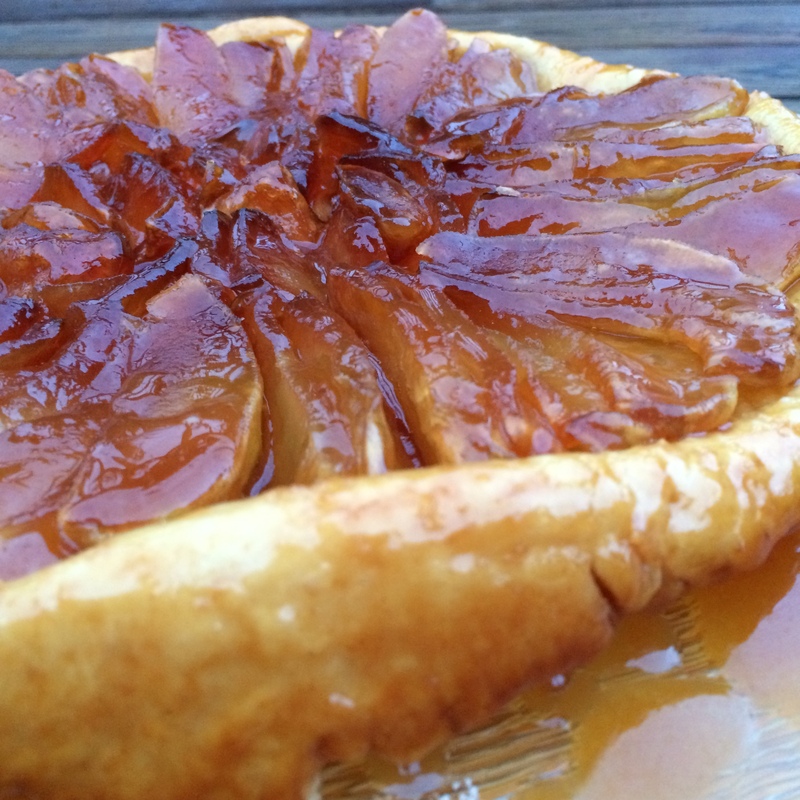 In my opinion, this apple tart beats your traditional apple pie any day. 5 lbs tart apples, peeled, halved, and cored. 1. To make the pastry, place the flour and salt in a food processor and process to mix. Add the butter and process until the mixture resembles coarse cornmeal. With the food processor running, slowly add the water and process just until combined and crumbly. Turn the dough out onto a lightly floured surface and gently press it into ball. Refrigerate for at least 1 hour. 2. Spread the sugar evenly over the bottom of a very heavy 10 1/2 inch oven-proof skillet or flame-proof baking pan. 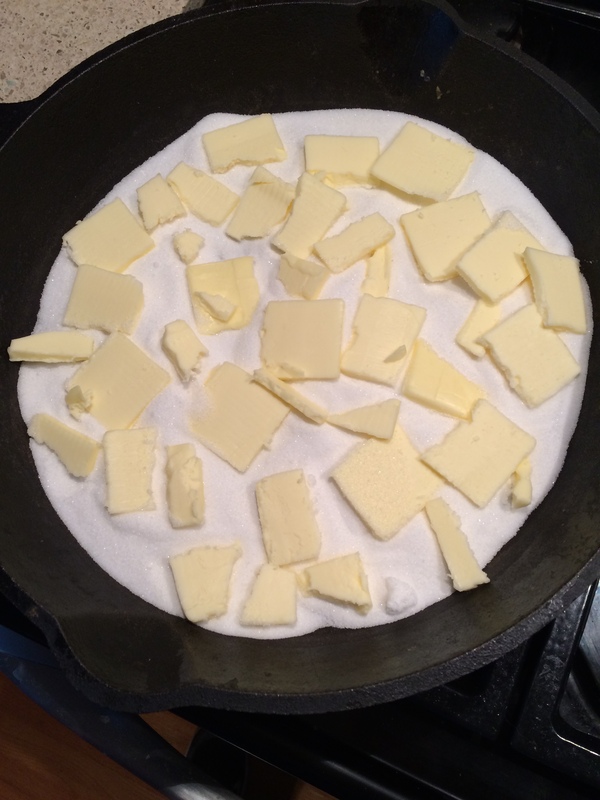 Place the butter slices evenly over the sugar, then arrange the apple halves on top of the butter. Begin at the outside edge and stand the halves on their sides, facing in one direction with stem ends toward the center. Pack the apples as close together as possible, gently pushing them together so they are held standing by pressure. Make a second circle of apple halves inside the first, packing them in on their edges as well. Place one apple half right in the center of the second circle to fill in the small space that remains. the idea is to get as many apples into the pan as possible, while keeping them nicely arranged. 3. Place the skillet over medium-low heat and cook the apples in the butter and sugar, uncovered, until the sugar turns golden brown; this will take at least 1 hour. Watch the apples closely to be sure they don’t stick; you may want to adjust the heat now and then, to slow down or speed up the cooking. As the sugar and butter melt and the apples give up some of their juices, baste the apples occasionally with a turkey baster. 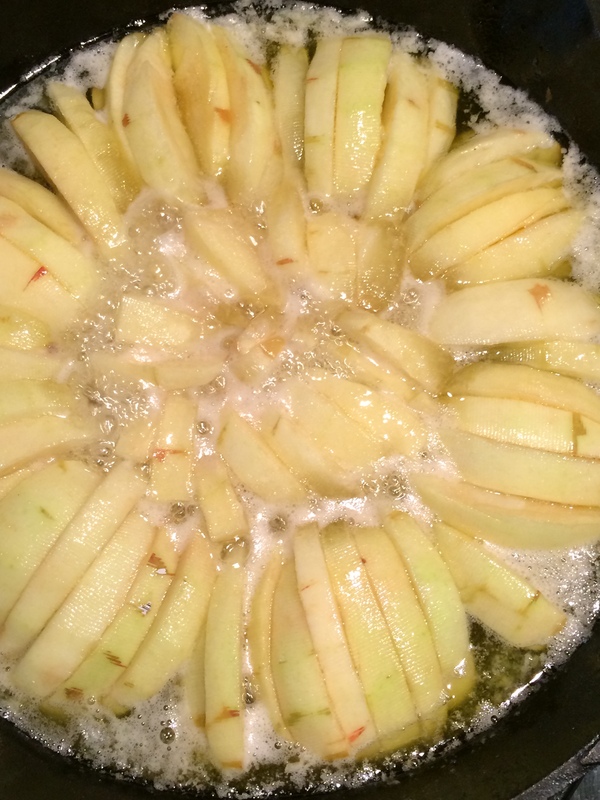 Gradually, the sugar will caramelize the apples nearly all the way through, though they will remain uncooked on top. 5. When the cooking juices are deep golden and the apples are nearly cooked through, remove the pastry from the refrigerator and roll it out to a size a little bigger than the skillet. Quickly and carefully place it over the apples, gently pushing in down around them, simultaneously easing it toward the center so that if it shrinks on the sides there will still be enough of it to cover the apples. Using a sharp knife, trim off and discard any extra pastry. Cut a few slits into the crust to let steam escape. 6. Place the skillet on a baking sheet. Bake in the center of the oven until the pastry is golden, 25 to 30 minutes. Don’t be concerned if the juices bubble over; the tart will be more or less juicy, depending on the variety of apple you’ve used. 7. Remove the skillet from the oven. Immediately invert a serving platter with a slight lip over the skillet. Quickly but carefully invert the two so the crust is on the bottom, the apples are on top and the juices don’t run off onto the floor. Remove the skillet. Should any apples stick to it, gently remove them and reinsert them into their rightful place in the tart. 8. Serve generous slices as soon as the tart has cooled slightly, but is still very warm. I’m not a pie fan either, but this looks so warm and inviting. I’ll have to try!